As of the writing of this newsletter, rains are widespread through Florida, owing to a slow-moving center of low pressure positioned over the eastern Gulf of Mexico. These rains have been intermittent, bringing variable rainfall amounts across the state and demonstrating the value of a high-density rainfall-observation network such as CoCoRaHS, and will help ease dry/drought conditions that persist in some sections. With that, we thank you for your due diligence in keeping up with daily reporting. Speaking of which, we want to extend a hearty welcome to all the new observers! During March Madness, discussed further later in this newsletter, we added 120 more of you, and more were added in February before that and April and so far in May after that. If you signed up to be an observer but have not purchased a gauge or begun submitting reports, it is never too late to start! If you have questions, get in touch with us. We will be happy to answer any and all questions. (1) Failing to keep a hard-copy record -- Usually, the first step in our quality control is for a coordinator (one of us or one of the regional coordinators) to send you a message to address a potential error. It is very helpful for you to have a written hard-copy record of your daily totals as we work together to address potential errors. (2) Failing to use the special form for multi-day rainfall totals -- Circumstances may arise in which you cannot make an observation each day (illness, vacation, etc.). In that case, you should use the special "Multi-Day Accumulation Report" form instead of the regular daily form, which should be used to report totals that accumulated over ~24 hours only. (3) Shifting dates -- Some of you will choose to report daily totals in batches every few days. However, a relatively common mistake is to switch a day's total with another day. The key is to be careful in making entries, and this is where keeping a hard-copy record can be helpful. (4) Providing incorrect time of observation -- The standard daily report form comes with a default time of observation (often 7:00 AM) that you selected when you signed up. If you empty your gauge at a time different from that default time, you should be sure to change it. (5) Not using the official gauge -- We have noticed from your comments and correspondence that some of you are using gauges associated with your home weather stations. Please be sure to purchase an official gauge because use of the official gauge is important for maintaining consistency among observations. Several other items are discussed in this newsletter. We hope you enjoy it, and feel free to drop us a line any time! Florida places second in March Madness! As reported in the last newsletter, CoCoRaHS has an annual observer-recruitment push known as March Madness each March. March Madness pits the 50 states against each other, and whichever state recruits the most new observers wins. In 2017, Florida recruited the most new observers, winning March Madness. This year, Florida recruited 120 new observers, the second most of all the states, and South Carolina led recruitment, having brought on 178 new observers. 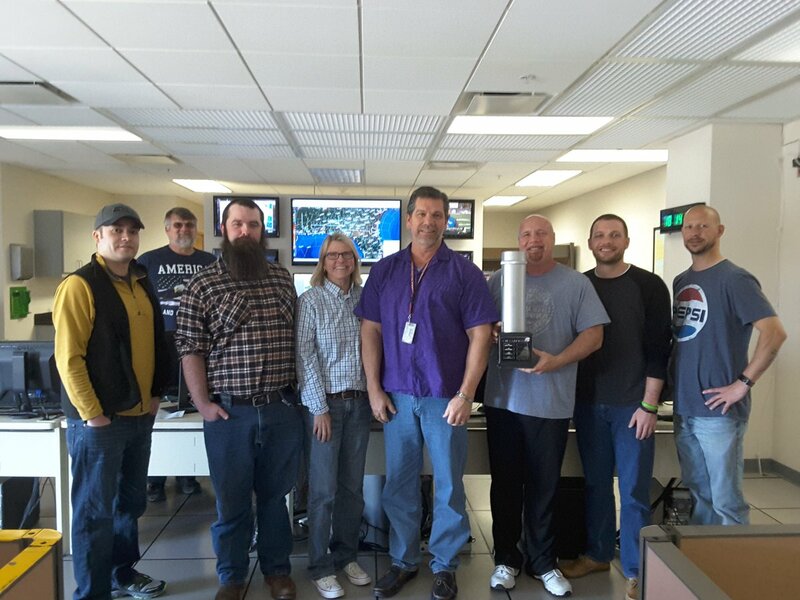 Pictured below is the cup at the Tallahassee National Weather Service office soon before it was shipped off to Columbia, South Carolina. If you have questions or are a reporter looking to do a news story on CoCoRaHS or or are with an organization that is positioned to promote CoCoRaHS, please contact Danny Brouillette at dbrouillette@coaps.fsu.edu or 850-644-0719. In 1998, following a catastrophic heavy-rain and flash-flooding event occurred in Fort Collins, Colorado, the need was realized for a high-density rainfall-observation network. Out of this need arose the Community Collaborative Rain, Hail, and Snow (CoCoRaHS) network. CoCoRaHS first was limited to Colorado, but, over the ensuing two decades, it expanded to all 50 states, the District of Columbia, Puerto Rico, the US Virgin Islands, Canada, and the Bahamas. 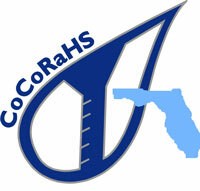 Read more about the CoCoRaHS story here. 23 February 2018, Tampa 5.1S, Hillsborough County (HB-10): " Yet another 'much too warm much too soon' late winter day at my South Tampa location today." 19 March 2018, Gainesville 1.7SE, Alachua County (AL-26): " Heavy thunderstorm near and during 7:00 a.m. gauge check. The amount recorded was at that time, and the storm let up about 20 min. later. Lighter, spotty rain had commenced shortly after midnight, 3/19." 2 April 2018, Citrus Park 1.3ENE, Hillsborough County (HB-5): " We had no rain, but within 3 blocks to the east of my home there was standing water from a sea-breeze induced shower that formed just at most 1000 feet to my east at about 5:00 PM. As I went further east, there was quite a bit of water near Dale Mabry HWY." 15 April 2018, Quincy 6.0SW, Gadsden County (GD-1): " Rain began 0640hrs, intermittent pulses of rain through 0830hrs, with heavy wind gusts, L&T distant; electricity out 0810-0839hrs; light rain at time of gauge read. Dawn as above, gusty, low 67°F with sopping grass & standing puddles." 1 May 2018, Panama City 6.9ESE, Bay County (BY-16): " I'd do a rain dance. But, at my age, I don't believe I would be able to handle a two-week dance." At this time of year, many of us wonder what lies ahead for the summer season. The Climate Prediction Center (CPC), part of the National Oceanic and Atmospheric Administration (NOAA), periodically issues outlooks for climatic conditions in the United States and elsewhere at bi-weekly, monthly, seasonal, and extra-seasonal time-scales. For May through July, the CPC outlook calls for an enhanced probability of above-normal temperatures over much of the United States, including all of Florida, as shown below. For the same time period, equal chances of above-, near-, or below-normal rainfall are outlooked for Florida and adjacent states. It is noted that the main controls on summer and early-fall rainfall in Florida are the behavior of sea-breeze-driven thunderstorms, which depends in good part on the position and strength of the Bermuda High, and whether, and how many, tropical cyclones form and then bring rainfall to the state. At any rate, summer is Florida's rainy season. In regard to this coming hurricane season, which officially begins on 1 June in the Atlantic Ocean, one early outlook from researchers at the Colorado State University calls for a slightly above-average number of tropical-cyclone formations. The main conditions driving this outlook are anomalously warm sea-surface temperatures and La Nina conditions that are now waning.